2 Can Cocoa Powder for Baking Be Used to Make a Drink? Antioxidant flavonoids, present in healthy dark chocolate, have been found by researchers to positively impact cardiovascular health when introduced into the diet. You may have heard that flavonoid-rich chocolate is good for you, but wonder which types of chocolate are best. Some brands and types of chocolate actually remove these positive nutrients. 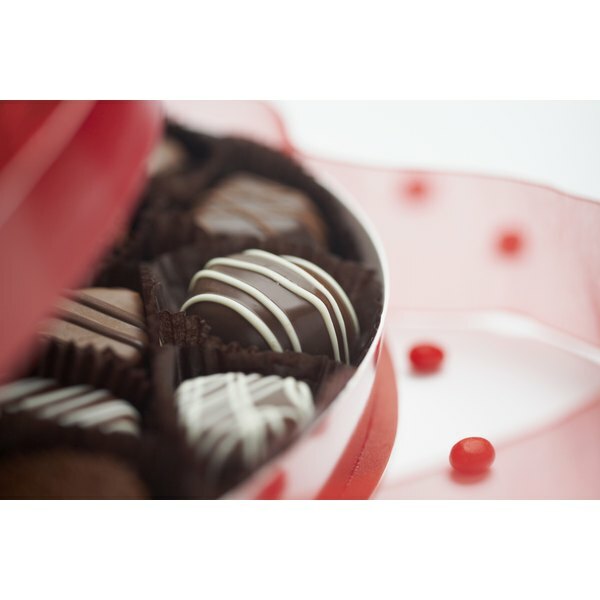 The highest flavonoid content, according to the Mayo Clinic, is in the darkest of chocolates. Manufacturers of natural chocolates would add to that criteria an absence of heat refinement. Still, a rule of thumb that holds true is that the greater the percentage of cocoa (cacao), the greater flavonoid content possible. The highest percentages of cocoa are found first in dark chocolate and then in milk chocolate. The exception is white chocolate; its processing removes all flavonoids. The demand for healthy dark chocolate has prompted master chocolatiers, such as Lindt and Toblerone, to market products with extremely high cocoa contents. These imported brands probably contain much higher flavonoid levels than mainstream American candy bars, but lower than cold-pressed natural chocolates. While Swiss chocolates from Lindt are refined and do contain sugar, they are available in very dark 85 percent and 99 percent cocoa formulations. This type of chocolate is good for you in moderation. It’s the saturated fat and calories in cocoa butter that detract slightly from the benefits of dark chocolate. As more and more health-conscious consumers realize that chocolate is good for you, chocolatiers try to optimize the healthy benefits by preserving as much flavonoid content as possible. Natural chocolate makers such as Dagoba and Xocai present superior healthy dark chocolates, Dagoba taking the organic route and Xocai boasting its cold manufacturing process. Dagoba offers an 87 percent cocoa bar, while Xocai promises a full 100 percent of flavonoid nutrients regardless of the percentage of cocoa in its natural chocolate products. Its unprocessed chocolate bars contain no processed sugars, either. Adding power foods such as almonds and blueberries to chocolate—or adding healthy dark chocolate to other foods—can enhance the level of antioxidants you get. It can also add calories, so eat this “enhanced” chocolate in even greater moderation. Both Xocai and Dagoba make fruit-enhanced bars that blend dark chocolate with acai berries. Swiss makers make sure their chocolate is good for you by adding hazelnuts, almonds, honey and other healthy ingredients. Almond manufacturer Blue Diamond markets an almond “milk” beverage that is fortified with vitamins A and E, calcium, and—yes—heart-healthy chocolate.